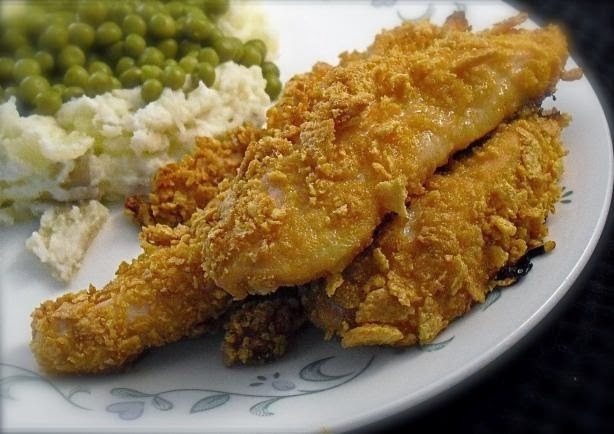 A delicious 'unfried' chicken recipe,that is so simple,and tastes so good that you won't believe that it's only 6 Ww points per serving.Also good for those watching their cholesterol levels! I usually use boneless chicken breasts,cut into fingers,to speed the cooking time up a bit,and make it more child friendly. Preheat oven to 375 degrees.Spray a large shallow baking pan with non stick spray. Whisk together the first five ingredients in a large bowl,then add the chicken,tossing to coat. Put the cornflake crumbs into a large ziplock bag,and add the chicken one piece at a time,shaking to coat. Place the chicken in the baking pan,spray the top of the chicken lightly with nonstick spray.Bake until golden brown and cooked through (do not turn),about 45 minutes. 0 Response to "Unfried Chicken ( Ww )"